Grants  is a small town in western New Mexico, United States. It was established by three Canadian brothers who had the contract to build a section of the Atlantic and Pacific Railroad through the area in the 1880's. It is one of the stops along the historic Route 66 highway west of Albuquerque, New Mexico's largest city. After the construction of the railroad, Grants survived as a rail and lumber town, serving as a section point on the Santa Fe Railroad and terminus for short line logging railroads that operated in the Zuni Mountains. The Mormon farmers up the road at Bluewater helped it gain prominence as the "carrot capital" of the US. Grants expanded dramatically during the 1950s as a result of the discovery of rich uranium ore in the area. A crash in the uranium market around 1980 seriously damaged the town's economy, but in recent years it has recovered somewhat. Grants is about 75 miles from Albuquerque by car, along Interstate 40, which at this point follows the historic Route 66. Albuquerque International Sunport is the nearest major airport. Grants is not presently served by any commuter airlines, but it's so close to Albuquerque that you might as well drive anyway. Grants sprawls more than its current population would suggest. It's not large, but many of the motels are near the Interstate and fairly far out of downtown, such as it is. As such, driving or cycling are the preferred modes of transport. A bike is handy for around town, but a car is a must for getting to the various nearby attractions. Public transport in the form of a local bus line is available; call the Grants/Cibola County Chamber of Commerce at 505-287-4608 for more information. Schedules tend to be irregular. No taxi services exist in the city. The New Mexico Mining Museum chronicles the region's uranium-mining history. 100 N. Iron Avenue; open 9-4 M-S; admission $3, students and seniors $2. It's rare for a scenic turnout/rest area along an Interstate to be worth mentioning in a "See" entry, but two exceptions are nearby. A viewpoint between Albuquerque and Grants gives a striking view of the "Sky City" at Acoma Pueblo. Further west, another scenic turnout offers views into one of the continental United States' most recent volcanic basalt flows, erupted from a vent a few miles south of the highway some time in the last 2000 years (estimates for the age vary). Grants is a good base for visiting the western pueblos of New Mexico. Acoma, Laguna, and Zuni are all nearby, and offer much to the visitor interested in the Pueblo Nations. Acoma recently opened a fabulous new cultural center at the base of Sky City; visitors seeking to tour the pueblo must check in here for their tour. Feast days, pow-wows, and various events throughout the year keep things interesting at all three pueblos. Like most small communities, Grants has its share of local events and festivals. Call the Chamber of Commerce at 505-287-4802 or the El Malpais Visitor Center at 505-876-2783 for more information. The El Malpais Visitor Center, on the east side of the city at Exit 85 off I-40, is a good place to get oriented with the area. Exhibits in the center highlight the many outdoor recreation opportunities in the region. The center's theater shows the award-winning short documentary "Remembered Earth," a wonderful film that reveals the story of the regions landscapes. The National Park Service runs the center. The primary draw of the region is the enticing mix of outdoor recreation and cultural sites. With two national parks, a national forest district, a Bureau of Land Management conservation area, designated wilderness, and a nearby state park, there's plenty for the outdoor recreation seeker to do out here. Cycling, cross country skiing, hiking, birdwatching, astronomy, photography, jeeping, ATV riding, horseback riding; it's all possible in the area. For those interested in the cultures of New Mexico, the three nearby pueblos and the Navajo Nation offer many opportunities to get acquainted with the Native Americans of the region. Feast days, fairs, and other events are usually open to the public, and tours of the pueblos are usually available. Acoma has a very well organized tour enterprise that makes it easy to visit the pueblo. Zuni has a visitor center and museum, and Laguna allows visits to the San Jose mission church. Grants itself is not a particularly notable source of art or memorabilia, but its proximity to Navajo Nation as well as Acoma, Laguna, and Zuni means that American Indian arts and crafts are widely available. Several trading posts operate in the Grants/Milan area; the most comprehensive selection is at Elkins Chaco Canyon Trading Company, just east of Exit 79 in Milan. See under Get out below for information on an interesting series of Navajo rug auctions; finding lodging in Grants is a good idea if you're attending this auction, there being no lodging near the auction site. La Ventana, one block north of Santa Fe avenue on Geis Street, has delicious steaks and New Mexican cuisine. Non-smoking and open late. El Cafecito, 820 E Santa Fe Avenue, +1 505 285-6229. A local favorite for basic New Mexican cuisine including Navajo Tacos and Blue Corn. El Ranchero, 705 Highway 66 (in Milan), +1 505 876-1032. Has killer hot red chile. Wow Diner, 1300 Motel Drive (off Exit 79 in Milan), +1 505 287-3801. A newly opened restaurant sheathed in stainless steel with a great menu. The chains include Denny's, Subway, Blake's Lotaburger, Taco Bell, Pizza Hut, Domino's Pizza, and Sonic Drive-In. Canton Cafe, 1212 E. Santa Fe Ave., +1 505 287-8314,  serves Chinese food at a low price. Quite crowded during lunch and dinner. A few watering holes exist here. They are a bit on the rough side; tippler beware. All are located along Santa Fe Avenue, which is also Route 66 through Grants and Milan. Outlaws often features live music acts or DJs, and has pool tables and big screen televisions. La Ventana Restaurant has a small but pleasant bar for a more mellow atmosphere. Most of the usual motel/motor-lodge chains can be found near I-40 exits. Best Western, Days Inn, Holiday Inn (Express), Super 8, Travelodge and the Choice Hotels collection (specifically, a Quality Inn) all have franchises. Most are not fully booked during most of the year, but reservations are a good idea at peak travel times, and also during the first or second week in October, when the Albuquerque International Balloon Fiesta fills hotels and motels up to a hundred miles away. For the more adventurous, some old Route 66 classics are still hanging on along the Mother Road on the east side of town. Check out the Leisure Lodge, the Southwest Motor Lodge, the Desert Sun Motel, the Franciscan, and the El Dorado Motel for more budget oriented accommodations. 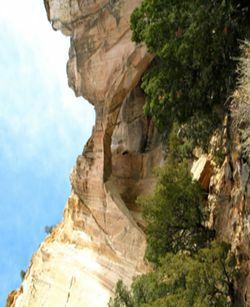 El Malpais National Monument is a rugged national park that offers hiking and a chance to explore lava flows, lava-tube caves, volcanoes, the famous La Ventana Arch, and many cliffs and canyons. The famous Bandera Volcano and Ice Cave attraction is also within the park, offering two trails that lead into the Ice Cave and into the crater of Bandera Volcano. Just beyond El Malpais is the El Morro National Monument , which features historic inscriptions and petroglyphs along with a nice 2 mile hike over the mesa past ancient ruins. The area is surrounded by the Cibola National Forest, Mount Taylor Ranger District. This district includes the Zuni Mountains to the southwest of Grants, and Mount Taylor and the San Mateo Mountains to the northeast of Grants. Gooseberry Springs Trail provides hikers with access to the summit of Mount Taylor, the region's highest peak at 11,301 feet. Many forest roads allow mountain bikers, jeepers, and hikers to easily access the forest lands. The Navajo Nation covers much of northwestern New Mexico and offers various points of interest. If interested in Navajo rugs, be sure to check out a rug auction  at the tiny town of Crownpoint, an hour north of Grants. Auctions are held on Friday nights every month or two, "usually ... but not always" on the third Friday of the month (see site below for schedule), and are both an opportunity to acquire some quality folk art at excellent prices and a fascinating cultural study. Chaco Culture National Historical Park is 90 miles north of town; Grants is a good place to find lodging if you're bound for Chaco, there being no lodging in the park other than a very basic campground.